And the reveal came accidentally from a book excerpt. 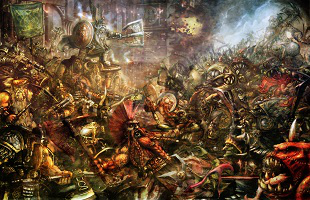 Every Warhammer fan I know has asked for it, and now? You shall finally receive, as Creative Assembly appears to be hard at work on a Total War game set inside Games Workshop's Chaos-filled fantasy world. The good news comes from Total War Center, where a poster named StormOfRazors has posted screenshots from the soon-to-be-released book The Art of Total War. Due out on January 20th, the poster got his/her hands on a copy early, and posted screenshots of the page in question. Quoted on the page is Creative Assembly creative director Mike Simpson, who shines a light on a few forthcoming CA projects. Total War: Arena and Kingdom are already out in the wild (the latter perhaps better known as Total War Battles: Kingdom, albeit in preview or beta form, leaving Total War: Warhammer was the sole true reveal. Creative Assembly's last major Total War release, 2014's Total War: Rome II received warm reviews from the likes of us, as did Alien: Isolation. In other words? The skills match the content pedigree here, for sure. Given the release date of the book, additional information about Creative Assembly's Warhammer endeavor is probably coming in short order. Then again, they could leave us all hanging for a spell until E3. I don't mind daydreaming about the possibilities for a few months, do you?